My vote for the FCS Top 25 for the week ending 11/4/2013 follows below the flip. But first, check out this great picture from the crazy Delaware/Towson game this weekend, courtesy of Towson Athletics. Three times, Towson had a chance to put away Delaware up by 2 touchdowns. Three times, the Tigers didn’t convert. With 4 minutes, 19 seconds left in the third quarter, Towson (8-2 overall and 4-2 in the Colonial Athletic Association) had a chance to pad a 28-10 advantage, but senior PK Drew Evangelista’s field-goal attempt from 33 yards banged off the left upright. On the ensuing possession, Tigers LB Monte Gaddis put enough pressure on Blue Hens senior QB Trevor Sasek to incite him to float a deep pass that junior CB Tye Smith intercepted at Towson’s 26-yard line. Smith wove his way 74 yards into the end zone, but the Tigers were flagged for clipping, which nullified the touchdown with 2:27 remaining. And on Delaware’s penultimate series of the contest, Sasek severely underthrew junior WR Michael Johnson on second down-and-2 at Towson’s 16, but Smith dropped a sure interception that would have led to the Tigers cementing a 31-17 lead. Instead, Delaware would rally from 22 points down in the fourth quarter to escape Johnny Unitas stadium with a 32-31 victory, stunning the Towson crowd. You could say everything about this win for Delaware was Lehigh-esque: from the amazing second half comeback from three scores down to the stunned silence from Johnny Unitas stadium, the same one that Lehigh delivered in 2011 in their 40-38 playoff victory. It’s that time of the week where I share with you your weekly Lehigh fan viewing guide for Week 10 of the college football season. Why go to website after website when all the information you need is right here? If there was ever a week where you, dear Reader, needed this page, it’s this week, since Lehigh has their bye week. Fortunately for all of us (and, of course, I include myself in this), there are a boatload of important games available on live streams to watch this weekend. Many, many of them are free. It’s worth popping open a Yuengling and getting the yard work done early. 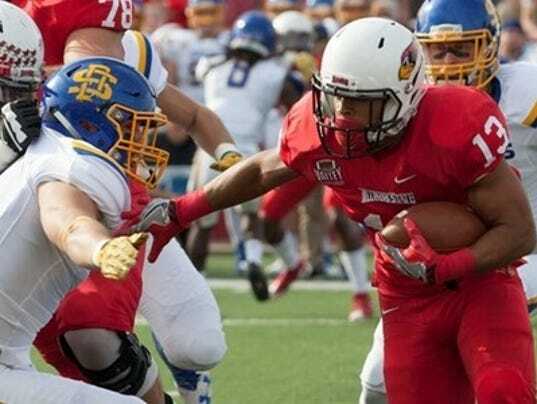 My vote for the FCS Top 25 for the week ending 10/21/2013 follows below the flip. The season’s playoff hopes were about dead after Villanova (4-3) scored two touchdowns in a span of 46 seconds to take a 28-21 lead with 1:09 left in the game. But UNH got a 35-yard kickoff return from RS Dalton Crossan, plus 15 yards on a late-hit personal foul, to take over at the 50 with 1:02 on the clock. New Hampshire survived a fumble on an attempted hook-and-ladder play, got a pair of catches from RB Chris Setian for 24 total yards, and then QB Sean Goldrich (21-for-28, 236 yards, touchdown) turned a broken play into a 4-yard touchdown scramble to pull his team within one, 28-27, with just under 14 seconds remaining. That put the pressure on head coach Sean McDonnell to decide whether or not to go for two. He said that offensive coordinator Ryan Carty “was pretty adamant” about going for the win. It turned out that Villanova was ready for Setian, but the senior captain bulled to the game-winning conversion anyway, capping a stellar day – career-high 88 yards on 12 carries and three catches for 28 yards. It’s that time of the week where I share with you your weekly Lehigh fan viewing guide for Week 8 of the college football season. Why go to website after website when all the information you need is right here? After the game, there are a boatload of important games, most which are available via live streams! My vote for the FCS Top 25 for the week ending 10/7/2013 follows below the flip. The sad thing is, this picture was a great one – but Birdsong’s ostrich-like touchdown pose would not count for any points, since it would be called back for holding. James Madsion would go into halftime with a 7-6 lead, but both teams would erupt in the second half, ending in a 38-31 marathon. 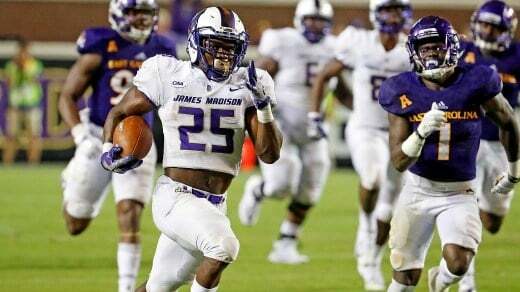 Dukes KR Dejor Simmons would take the second-half kickoff for a 100 yard touchdown run, and James Madison wouldn’t trail by any more than 5 after that point. It’s that time of the week where I share with you your weekly Lehigh fan viewing guide for Week 5of the college football season. Why go to website after website when all the information you need is right here? This week’s FCS Top 20 Clash at Murray Goodman will by broadcast on Service Electric 2 with Mike Zambelli, Mike Yadush and Al DiCarlo as the announcers. For those not in the Lehigh Valley it will also be streamed for free on the Patriot League Network. And I’ll be listenting to the pregame on ESPN 1230 and 1320 of the Lehigh Valley, too, with Tom Fallon, Matt Kerr and Matt Markus. That will also be live streamed here. My vote for the FCS Top 25 for the week ending 9/9/2013 follows below the flip.